There are two kinds of stand at Art Fairs: those dedicated to a single artist and those showcasing a gallery’s stable as a whole. The former are best for discovering new voices, for which it is hard to get an adequate feel from one or two works. The latter, by showing a wide range, are more useful for picking up on the latest development in the work of a familiar artist. Here are nine such which I liked. Following on from early works which included texts dealing with AIDS issues, American artist Donald Moffett has worked in the rare genre of politically engaged abstraction, integrating gay politics into paintings on drilled wooden panels with holes and zips in which reference both Fontana’s piercing of the canvas and fetishistic clothing. Marianne Boesky’s elegant booth was dedicated to a new suite of nine paintings which use more traditional materials to elegiac ends: they take off from Walt Whitman’s account of dressing the wounded in the Civil War, and what looks like some kind of fur turns out to be made from tenderly extruded oil paint. 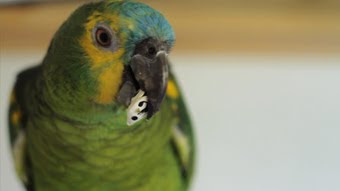 A charming video from the Brazilian artist best known for her hypnotizing film of leafcutter ants transporting coloured confetti: she exploits the match between a parrot and the Brazilian football colours by combining the bird with the sound of a typically breathless football commentary in the exaggeratedly excited national style. That allows for no pauses, and it seems the parrot is eating the punctuation made redundant in that peculiar language game. 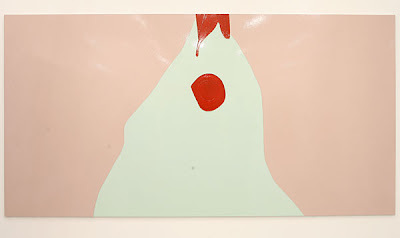 Gary Hume has previous in applying his trademark household gloss style to birds, but they have been European and often babies. His latest paintings blow up near-abstract close-ups of a bird of paradise to a vast scale to maximize the colour and joy. Escapist? Maybe – and whether anti-recessional or not, tropical birds seem to be in fashion. One could add to Neuenschwander and Hume an enormous toucan photograph by Wolfgang Tillmans and a fictional Bird of Paradise by Ryan Gander, or could wander out to Paradise Row’s new space to see Shezad Dawood put parrots through hoops of neon. The New York-based Canadian Marcel Dzama created his distinctive world of violence and dream in the 1990s through an addictive stream of watercolours, using root beer for the brown which has remained his most characteristic colour. Over the past decade he has expanded his characters’ reach through sculptures, dioramas, collage and film as well as paintings. Now we have a mannequin which rotates on its ceiling fan engine base, complete with costume, mask and gun. 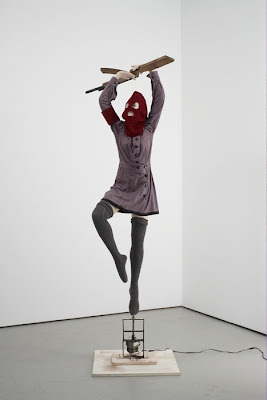 This spinning woman – one of the Revolution Dancers who do battle with ghost soldiers in Dzamaland – conflates the military and the balletic to mysterious effect. The Scottish artist Callum Innes has established a practice which is as much about unpainting as about painting. He has recently moved from a characteristic colour format which bisects the canvas and then halves one of halves by bleeding away the colour with turpentine, to one of two halves. That makes the removal less obvious – in fact, the story of the paintings is only fully visible from the side. Many layers of gesso are applied before a layer of black. 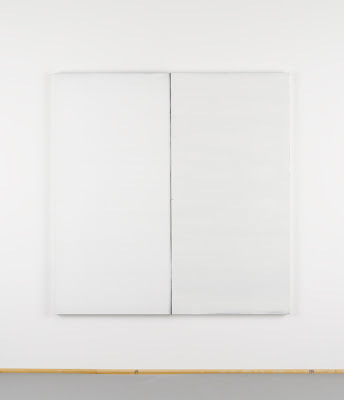 That black is washed away from one half to expose the white beneath, and the other half is painted a different colour: white in the example shown, but the Ingelby Gallery also has black, the Kerlin Gallery green and the Frith Street Gallery purple. At the central boundary of the two halves a black borderline remains. It’s not new for Wearing to show herself wearing the cast of another person in which it’s only her deep brown eyes which are ‘really her’: such photos have included herself as her father and brother. But this move into celebrity territory, and the need for a body cast showing ‘her’ flesh, are new. The self-portrait isn’t just in the eyes, but in the tribute to her influences of Warhol and behind him, Marcel Duchamp, whom Warhol was imitating in turn by dressing in drag in the top half of this image. 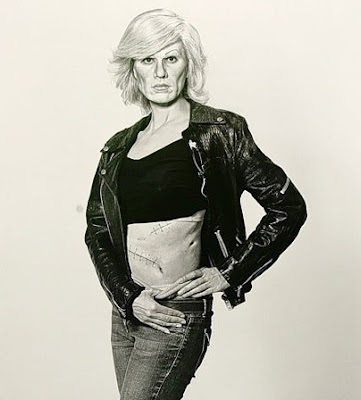 The lower half is based on Richard Avedon’s famous shot of Warhol revealing his scars following Valerie Solanas’ attack in 1968. Thomas Bayrle (born Berlin, 1937) has previously used the elements here – cars, engines and the rosary. He has often used traffic and roads as stand-ins for the overall systems which control us, and has drawn parallels between the church and industrialisation as the historical drivers behind modernity. That all plays into this new kinetic combination, in which one could just make out the German mutter of ‘Bitt für Uns’ beyond the Fair’s background hum as the windshield blades, denied their window, made a vain effort to cleanŠ the wall, the fair, the sins of its attendees, the world of art, the world? 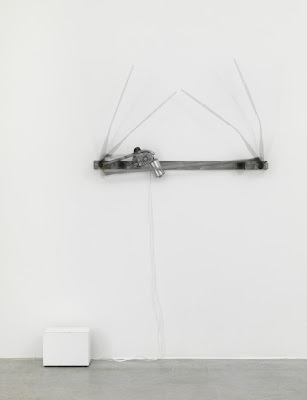 The imaginative US-Cuban partnership of Jennifer Allora and Guillermo Calzadilla has operated since 1995. They were right on the topical money with this abandoned petrol pump which appears to have reversed the process of oil extraction in turning back to a fossil-filled limestone. Perhaps they’re already envisaging the time when the world has moved on from oil – though there’s no telling whether this tableau is from a bright new carbon-free future which makes such pumps redundant, or an apocalyptic end of times which has rendered them customerless. New Zealand’s representative at last year’s Venice Biennale has made an ongoing series of figures with a hand-drawn wobbliness in hippyish tie-died hues which seem to combine an unidentifiable number of ethnographic references. 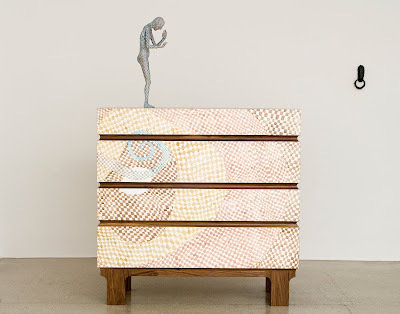 For her recent show at the Vienna Secession, Upritchard added a harlequin patterning inspired by its Gustav Klimt frieze and built a matching set of hand-painted oak drawers on which the figure stands. 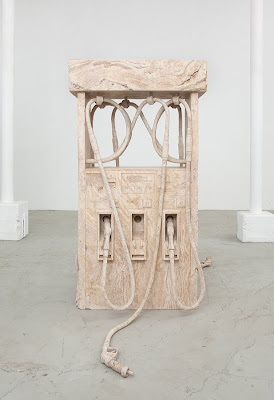 It contains various arty surprises, as does the whole of Kate MacGarry’s stand, much of which is secreted inside a larger cabinet designed by Martin Gamper.